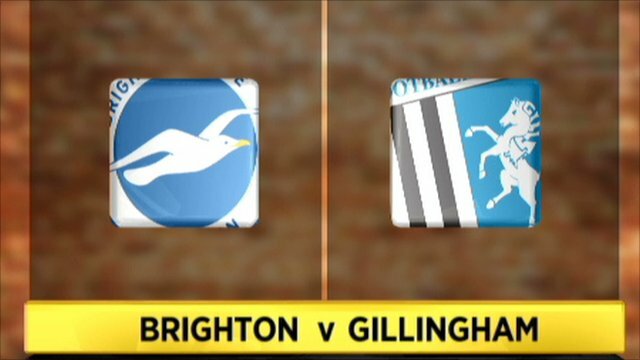 Brighton's second win in a week at their new Amex Stadium saw them through to the Carling Cup second round with a win over former landlords Gillingham. An Ashley Barnes second-half penalty, awarded for a foul on Will Buckley, was the difference between the sides. Before that Albion had made hard work of their stubborn League Two opponents. Buckley and Barnes both put decent chances wide early on, and winger Craig Noone wasted a couple of decent chances before Barnes struck the decisive blow. "I was pleased for a couple of reasons. Obviously we were not as good as last Saturday. But it's a cup game. You must think how much it means for them to come to this beautiful place. "The goal was quite late, and as you can imagine it was even more tension on the pitch. But saying that, clean sheet, we won and we're in the draw. Nothing to complain about. "The idea is to get experience, playing at the Amex, get used to the place, and win football games." 90:00+4:53 The referee brings the game to a close. 90:00+4:19 Danny Kedwell gives away a free kick for an unfair challenge on Liam Bridcutt. Liam Bridcutt restarts play with the free kick. 90:00+3:53 Booking Danny Kedwell is given a yellow card. 90:00+3:34 Unfair challenge on Marcos Painter by Danny Kedwell results in a free kick. Marcos Painter takes the direct free kick. 90:00+2:22 Corner taken short by Craig Noone. 88:55 Ashley Barnes fouled by Andy Frampton, the ref awards a free kick. Strike on goal comes in from Craig Noone from the free kick. 87:58 Foul by Lewis Montrose on Gary Dicker, free kick awarded. Inigo Calderon takes the direct free kick. 87:12 Unfair challenge on Ashley Barnes by Danny Kedwell results in a free kick. Direct free kick taken by Casper Ankergren. 85:25 Booking Booking for Marcos Painter for dissent. 85:08 Booking Casper Ankergren receives a yellow card for dissent. 84:55 Booking Stefan Payne booked for unsporting behaviour. 83:58 Stefan Payne challenges Will Buckley unfairly and gives away a free kick. Marcos Painter restarts play with the free kick. 82:50 Foul by Lewis Montrose on Romain Vincelot, free kick awarded. The free kick is delivered right-footed by Liam Bridcutt from left channel. 82:19 Free kick awarded for an unfair challenge on Danny Kedwell by Liam Bridcutt. Free kick taken by Matt Fish. 79:25 Substitution Barry Fuller leaves the field to be replaced by Matt Fish. 72:37 Booking Jack Payne receives a yellow card for unsporting behaviour. 72:23 Free kick awarded for an unfair challenge on Craig Noone by Jack Payne. Liam Bridcutt restarts play with the free kick. 70:48 Substitution Danny Spiller leaves the field to be replaced by Stefan Payne. 70:26 Chris Whelpdale fouled by Romain Vincelot, the ref awards a free kick. Matt Lawrence takes the direct free kick. 66:21 GOAL - Ashley Barnes:Brighton 1 - 0 Gillingham Ashley Barnes scores a placed penalty. Brighton 1-0 Gillingham. 65:23 Booking The referee shows Joe Martin a yellow card for unsporting behaviour. 64:59 Penalty awarded for a foul by Joe Martin on Will Buckley. 63:47 Booking Matt Lawrence receives a yellow card for unsporting behaviour. 63:36 Matt Lawrence challenges Craig Noone unfairly and gives away a free kick. Free kick taken by Liam Bridcutt. 62:17 Will Buckley takes a shot. Blocked by Andy Frampton. Corner taken by Will Buckley from the right by-line, save by Ross Flitney. 58:54 Free kick awarded for a foul by Jack Payne on Craig Noone. Liam Bridcutt takes the direct free kick. 58:15 Free kick awarded for an unfair challenge on Marcos Painter by Chris Whelpdale. Lewis Dunk takes the free kick. 57:02 Substitution Charlie Lee leaves the field to be replaced by Curtis Weston. 56:47 Lewis Montrose gives away a free kick for an unfair challenge on Romain Vincelot. Liam Bridcutt restarts play with the free kick. 54:28 Charlie Lee takes a shot. Casper Ankergren makes a save. 53:32 Inswinging corner taken by Danny Spiller, Lewis Dunk manages to make a clearance. 52:27 Corner taken by Will Buckley, clearance made by Danny Spiller. 47:55 Danny Spiller crosses the ball in from the free kick, clearance made by Ashley Barnes. 47:55 Booking Lewis Dunk is shown a yellow card. 47:31 Charlie Lee fouled by Lewis Dunk, the ref awards a free kick. 47:04 Craig Noone takes a shot. Ross Flitney makes a save. 45:00+1:37 The match has reached half-time. 45:00+0:53 Effort from inside the area by Craig Noone misses to the right of the goal. 42:17 Foul by Romain Vincelot on Jack Payne, free kick awarded. Lewis Montrose takes the free kick. 40:08 Foul by Andy Frampton on Romain Vincelot, free kick awarded. Free kick taken by Liam Bridcutt. 37:48 Danny Kedwell has a header from close range and clears the crossbar. 37:09 Lewis Montrose fouled by Gary Dicker, the ref awards a free kick. Andy Frampton takes the direct free kick. 35:46 Effort from outside the box by Ashley Barnes goes wide right of the target. 32:54 Corner taken by Craig Noone from the right by-line, save by Ross Flitney. 31:55 Outswinging corner taken left-footed by Craig Noone from the left by-line. 31:15 Free kick awarded for an unfair challenge on Romain Vincelot by Charlie Lee. Liam Bridcutt restarts play with the free kick. 30:42 Ashley Barnes produces a header from inside the area that goes over the bar. 28:50 Barry Fuller fouled by Ashley Barnes, the ref awards a free kick. Ross Flitney takes the direct free kick. Free kick awarded for an unfair challenge on Danny Spiller by Liam Bridcutt. Danny Spiller takes the direct free kick. 27:54 Shot by Ashley Barnes from 18 yards. Blocked by Barry Fuller. 25:52 Booking Barry Fuller is shown a yellow card. 25:42 Barry Fuller challenges Will Buckley unfairly and gives away a free kick. Direct free kick taken by Will Buckley. 24:05 Effort from long distance by Craig Noone goes wide right of the target. 23:45 Unfair challenge on Craig Noone by Joe Martin results in a free kick. Liam Bridcutt takes the free kick. 20:09 Will Buckley has an effort at goal from outside the box which goes wide left of the goal. 17:41 Inswinging corner taken by Will Buckley from the left by-line. 11:51 Shot from just outside the box by Ashley Barnes misses to the right of the goal. 8:26 Free kick awarded for a foul by Lewis Montrose on Lewis Dunk. Lewis Dunk restarts play with the free kick. 6:14 Will Buckley takes a shot. Blocked by Charlie Lee. 5:12 Charlie Lee gives away a free kick for an unfair challenge on Will Buckley. Liam Bridcutt takes the direct free kick. 3:47 Danny Spiller challenges Inigo Calderon unfairly and gives away a free kick. Liam Bridcutt restarts play with the free kick. 2:30 Danny Kedwell produces a drilled right-footed shot from 20 yards. Blocked by Gordon Greer. 1:39 Charlie Lee is flagged offside by the assistant referee. Gordon Greer takes the free kick. 0:51 Outswinging corner taken from the right by-line by Danny Spiller.